Simple Systems for Straightforward Cleaning Since being introduced, the Reach & Wash® System has undergone a number of revisions. V4 system represents the latest, fourth generation of the Reach & Wash® vehicle-mount. Having pure water on-board means that window cleaning starts within minutes of arriving at the job site with the minimum of set-up time. 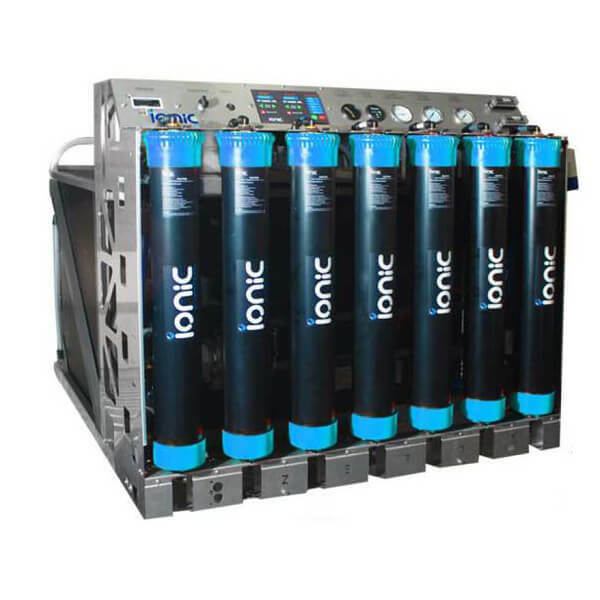 V4 system uses Ionic’s latest filter housings with replaceable filter cartridges mounted vertically on our trademark crash tested stainless steel frame. V4 boasts the use of John Guest fittings throughout ensuring a neat and leak free design. 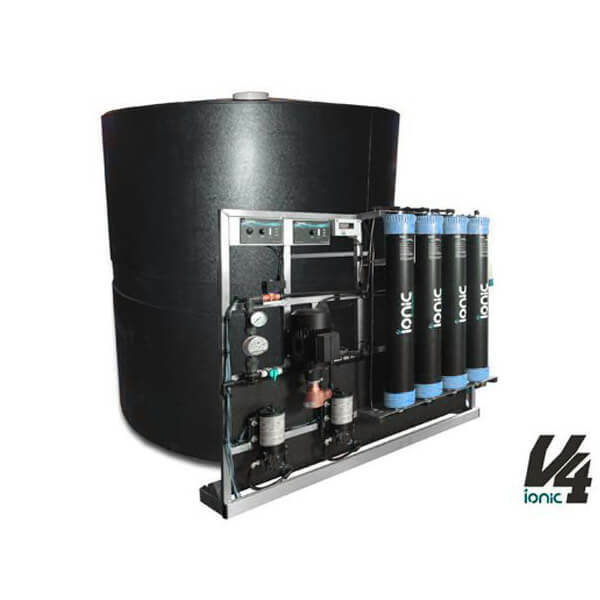 The standard V4 is available in a range of tank sizes from 300 to 1,000 litres to suit all types of commercial vans and only requires mains water pressure (min 45psi) to filter tap water down to zero parts per million purity. 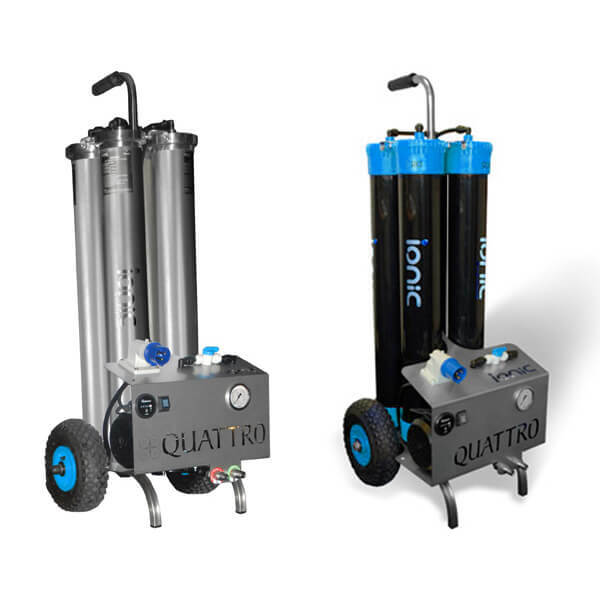 If a water supply is available on site then the V4 system can process pure water into the tank whilst the 12 volt pumps provide pure water for cleaning. 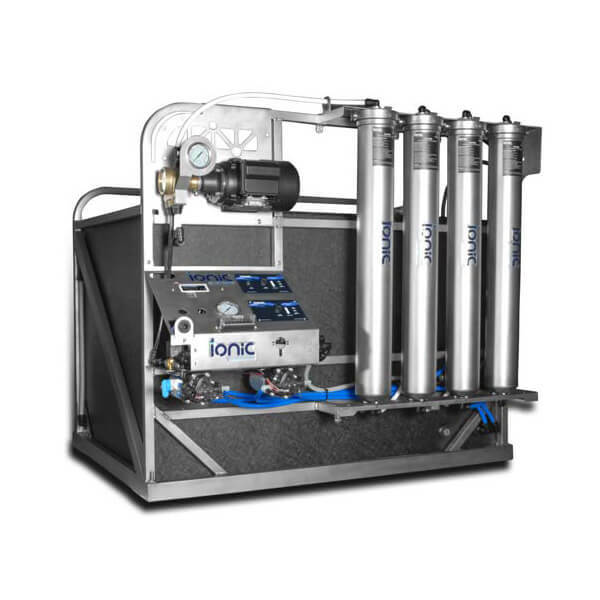 The standard V4 features a 12 volt pure water delivery pump operated by a variable pump speed controller, automatic tank-full shut off, and a water level indicator. FMVSS-208 Compliant Crash-Tested Steel Component Chassis. Additional 12v Delivery Pump and Pump Control. 240v or 110v Fast-fill Pump. High-Pressure Stainless Steel Filter Housings. Thermopure™ Hot Water Upgrade (with HotBox™).